After years of design and testing, AAI has developed a unique and rigid carving mechanism, and combined it with a simple and accurate alignment system that enables the Gemini Propeller Duplicator to easily and accurately carve a propeller. The rigidity of this machine assures much more accurate duplication of a blade than is currently possible with the lightweight and inherently flexible duplicators currently available. 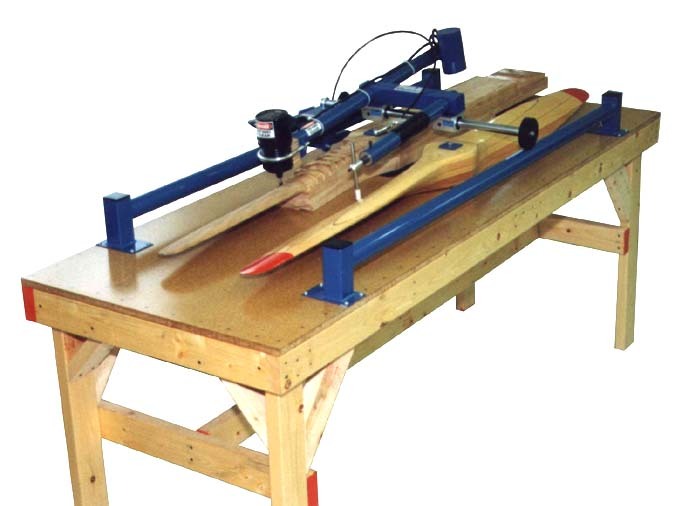 The Gemini Propeller Duplicator works on the principle of tracing an existing blade or pattern. It is very simple to set up and operate, and includes a novel brake mechanism to stabilize the cutting motion. The average builder will be able to quickly and precisely shape a propeller. Only sanding is required to achieve the finished shape. Because the Gemini Propeller Duplicator allows for the easy production of propellers, it will enable the builder to experiment with a number of propellers of different profiles to determine the optimum design for a particular airplane and engine. Once this optimum design is achieved, it will then be possible to precisely duplicate that shape over and over. Click on the picture above for a larger versions. Construction Table top mounted *, with ball bearing rollers and guides for arm. Please allow 6-8 weeks from receipt of deposit to delivery. All Gemini Propeller Carving Duplicators are equipped with a router and a 3/4" carbide-tipped router bit. 1 (one) each Allen wrenches sizes 3/16 " and 5/32", 2 (two) router wrenches, included with Router, and operating manual. Frieght shipping is required. Call for exact shipping/handling charges. Additional shipping/handling changes for International Sales. Custom Carvers available -- Will quote upon request.